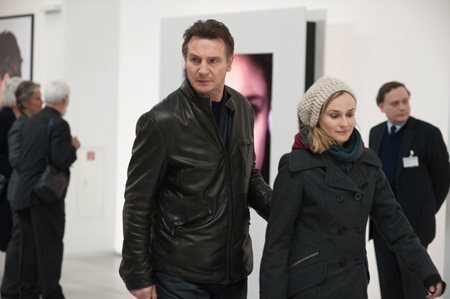 Liam Neeson stars in this taut thriller as a man who regains consciousness after an auto accident only to discover that another man is impersonating him, and that no one -- not even his wife (January Jones) -- recognizes his identity as the real Dr. Martin Harris. 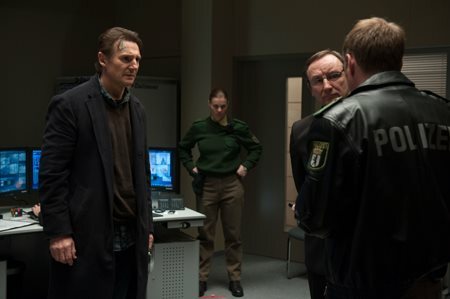 Finding himself with an unexpected ally (Diane Kruger), Harris struggles to solve the mystery and hang onto his own wits, while also being stalked by anonymous killers. 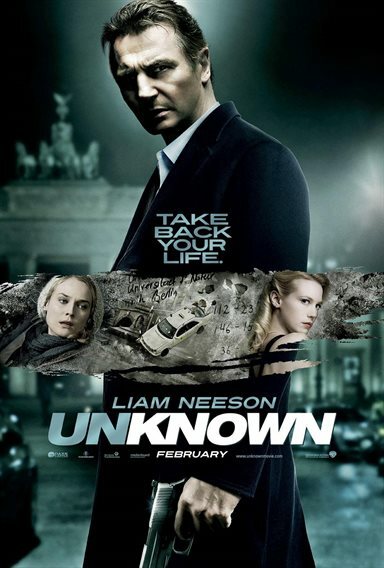 Download Unknown in Digital HD from the iTunes store. Unknown images are © Dark Castle Entertainment. All Rights Reserved. Unknown, the latest thriller film from Dark Castle and Warner Bros., stars Liam Neeson and is based on a story by Didier Van Cauwelaert. 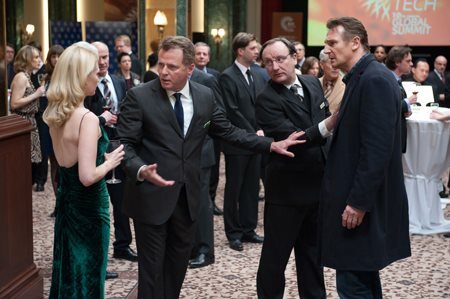 Dr. Martin Harris (Liam Neeson: Taken, Batman Begins) and his wife (January Jones: X-Men: First Class, Mad Men) head to Germany to speak at a conference in Berlin. 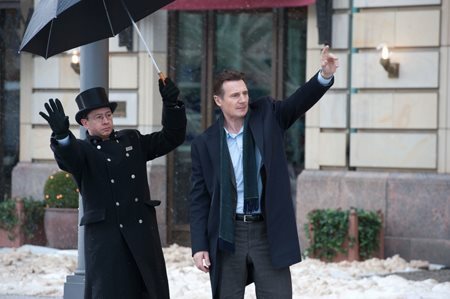 However, while checking in at the hotel, Dr. Martin Harris realizes he had left a piece of luggage at the airport and rushes away to retrieve it. An unfortunate accident ensues which causes Harris to wake up in a comma, only to find out his life has been turned up-side-down. His wife and the rest of the world are telling him he is not who he thinks he is. 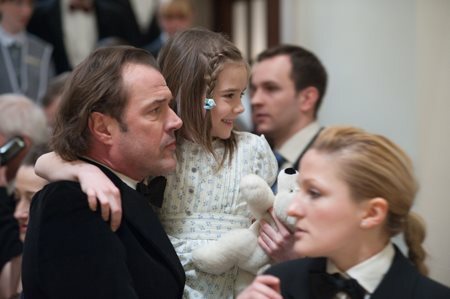 The screenplay, by Oliver Butcher and Stephen Cornwell, changes a few plot points from the original story and takes cues from other films, e.g. as Frantic and the Bourne Identity. It makes the audience feel like Unknown is a film that their mind can easily slip into and forget the real world for a while. 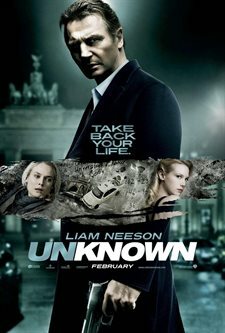 Unknown starts off a bit slow -- leaning towards a dramatic thriller with zero action -- but with such amazing actors and actresses in the mix, including the amazing Diane Kruger. The film tends to still move along at a pace that will not allow you to fall asleep. The Director, Jaume Collet-Serra, previously used by Dark Castle of The House of Wax remake, appears very comfortable with the film. 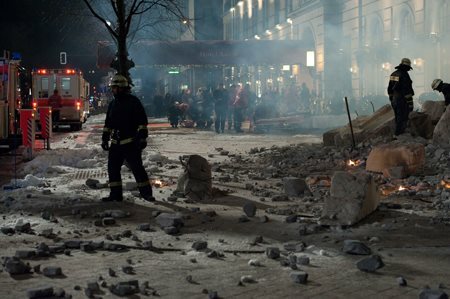 He provides great dramatic elements while still being able to handle the action scenes properly and does not leave the audience guessing what is going on the screen as former music video colleague, Michael Bay, would have done. While the film has an impressive runtime of 1 hour and 48 minutes, it feels like Unknown is really the first act in a much longer film involving the life of Dr. Martin Harris. While the film does have a climatic ending, most filmgoers will come out of the movie wondering where the second act is as it has just scratched the surface of what could have been done with this film. Hopefully, just like Liam Neeson's last European action thriller, Taken, we will see a sequel to this film explaining what has happened to his life after this initial origin story film. Unknown images © Dark Castle Entertainment. All Rights Reserved.